When it comes to sports memorabilia, copper, silver, and gold are usually associated with colored parallels in a Topps’ baseball card products; however, 2018 Baseball Treasure provides collectors with an opportunity to score a MLBPA licensed coin minted in a precious metal. Thirty of the top MLB players are included in this heavy-duty set. The coins come encased in a thick card that has the player’s name, team, and jersey number on the front, with similar info on the back, which allows the minted design to jump to the forefront. Each pack contains one of these cards, with the majority being of the copper variety. A deeper dive into the product could yield one of the .999 pure silver coins (1:432 packs) or an ultra rare gold Aaron Judge coin (52 in total). 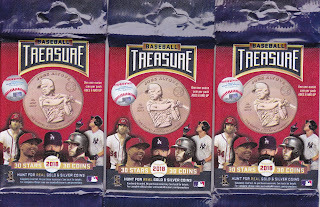 Baseball Treasure gives different entry points that allow a wide range of fans to get their hands on the coins. On their website, coins are available in quantities as small as three packs, and options go all the way up to a 432-pack case, pretty much guaranteeing one of the silver coins at those levels. The three packs opened for this review drew copper coins of Justin Bour, Paul Goldschmidt, and Yoan Moncada. Each coin presented well in their cards and look like they would make a perfect display for a work or home office desk in a proper holder. 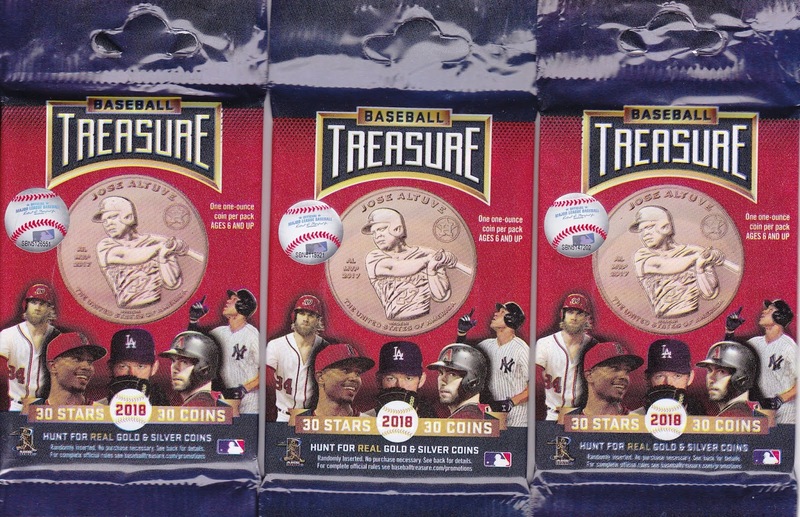 Baseball coins are not a new product, and while collectors looking to get into 2018 Baseball Treasure as an investment are probably better served putting their money into a mutual fund, a few packs would give most aficionados an interesting conversation piece that is a diversion from traditional baseball cards.